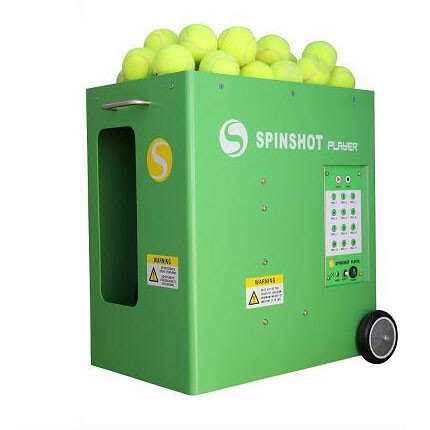 Spinshot Player is the most advanced battery operated portable tennis ball machine in the world. The revolutionary design means you can customise your drills to program height, direction, spin, speed for each of 6 sequential shots and then save these into your personalised drill. Control the machine through our mobile phone app, providing optimal usability and adjustment of its many features.This machine comes with 12 pre-programmed drills which give a full variety of shot positions. You can adjust each of these drills to suit your playing level or create your own drills. Easy programming enables you can make 2-line drill at any width and any height. You can make vertical oscillation with combined horizontal oscillation, or whatever oscillation mode you want to play with. All these can be made on your phone and saved into the machine. Next time when using the machine, just press the drill # button you require and start your game. The Player model was developed to be incredibly user friendly and can be operated by even the youngest of players. Android and iPhone based apps are free to download to control your new machine. See more detail from page of Player Remote. Spinshot Player can deliver balls up to 110kmph and with top spin, this can be adjusted right down to 30kmph to mimic all kinds of shots. Ball feed ratE is controllable from 2 seconds to 10 seconds every shot. Ball trajectory is electronically adjustable. Electronically adjustable for different degrees of back and top spin. Mastery of top and back spin is what separates the average player from a champion! The Spinshot Player tennis ball machine will allow you to program different oscillation parameters to customise your own court drills. You can program the spin, speed and shots in different oscillation modes. The tennis ball machine’s battery can support 2-3 hours of play. It won’t quit until you’re ready to stop. Simply charge after each use and it’s ready to go. The machine will be shipped with a battery charger that is compatible with our 12V batteries. The smart design of the power cage and removal of the battery cover makes it extremely easy to install the battery or upgrade your machine to an AC supply. The oversea orders will not be shipped with the battery. Customer need to order the battery from local vendor. It is lead acid 12V 12AH rechargeable battery. The foldable ball hopper holds over 120 balls. Portability – Smaller machine dimensions providing a more transportable unit. Construction – The robust powder coated metal construction of the Spinshot Player machine compared to a plastic product. Control – The Spinshot Player integrates a mobile phone remote control to adjust the ball position, speed and feed rate of every shot. 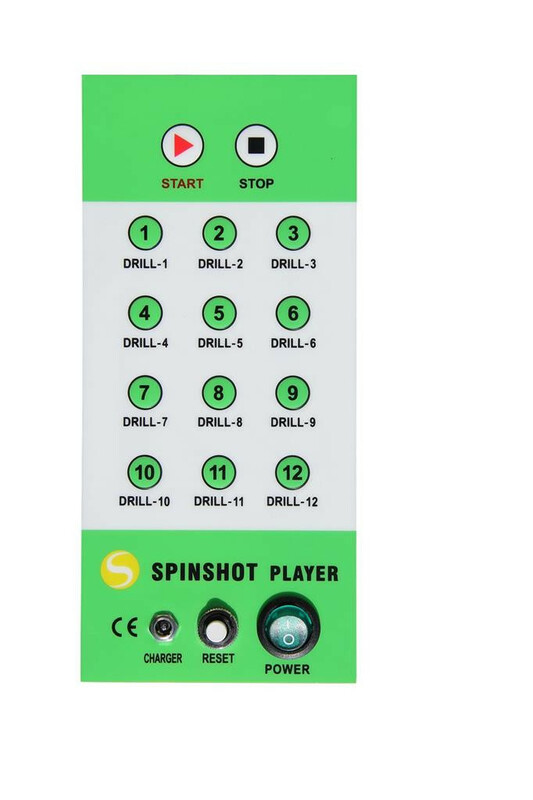 Programmable Drills – The Spinshot Player provides up to 12 programmable 6 shot drills. This compares to only 6 drills in competitor machines. Goregaon (East), Mumbai – 400 063, Maharashtra, INDIA.